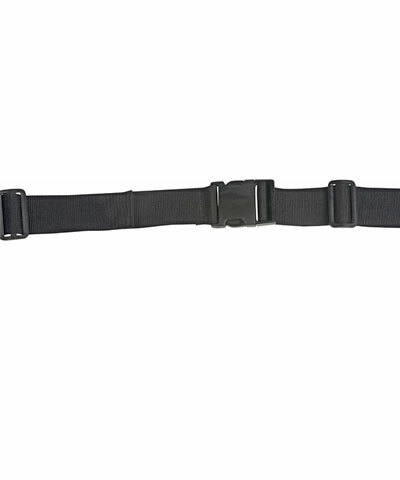 This accessory is a two piece positioning belt, 1" webbing, with a fastex closure. Tri-Glides are woven on the straps for tension adjustability. At the ends of the straps are easy to install belt anchors. This accesory is most often selected to be positioned at a 45 degree angle at the pelvis to maintain a neutral pelvic position though it can be utilized for other applications (I.E.- 90 degree lapbelt, etc. ). The BioForm positioning belts present a perfect complement to our seating systems. BioForm Positioning Belts are typically used at a 45 degree angle to properly position the pelvis or at a 90 degree angle across the femurs to maintain the leg contact with the seating surface. The belts are available in 1 ´, 1½" and 2" webbing widths and come with a choice of 3 closures; d-ring/velcro, fastex buckle and auto style buckle. Every belt comes standard with a tri-glide (for easy adjustment) and a d-ring /end fitting unit for easy mounting. A padded belt can be created by choosing one of our padded sleeve options.